Hope Pit and Stores at National Coal Mining Museum for England01924 848806work Museum - ScienceHope Pit is a fully restored colliery complex on the 17 hectare Museum site, totally dedicated to science. Discover hands-on interactive models, touch screen displays and some very special virtual guides. Understand the complex science of mining through fun interactive models and touch screen displays. After your visit to Hope Pit journey down to the settling ponds to discover how water pumped out of the mine is filtered to remove impurities, then wonder around the Nature Trail and see what wildlife you can spot along the way. 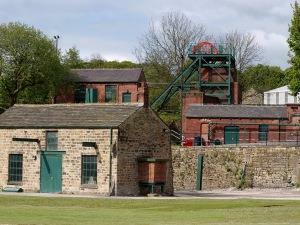 The Hope Pit buildings are accessible from 10am until 4pm (winter months) and 10am until 4.30pm (summer months). Hope Store can be accessed as well but is limited to a walk way. Visitors can view large objects, mining machinery and vehicles from the walk way. During the holiday periods visitors can see objects up close on selected days, normally Tuesdays and Thursdays 1pm - 4pm. Please check with the museum before you visit to avoid disappointment. The store opens during special event weekends, please check with the National Coal Mining Museum before your visit. Sat 6 - Sun 28 Apr Easter @ Pit! Leave the M1 at jct 40 (A638) towards Wakefield, take the 1st right after the traffic lights (Broadway). The Malt Shovel pub will be on your right. At the end of Broadway turn right onto the A642 to Horbury and Huddersfield. Bus Route: Yorkshire Traction Bus 232 from Wakefield Bus Station. Drops off outside the Reindeer Inn.